BEAUTY BOX. NEW YORK EXCHANGE PART 2. | Life Looks Perfect. BEAUTY BOX. NEW YORK EXCHANGE PART 2. 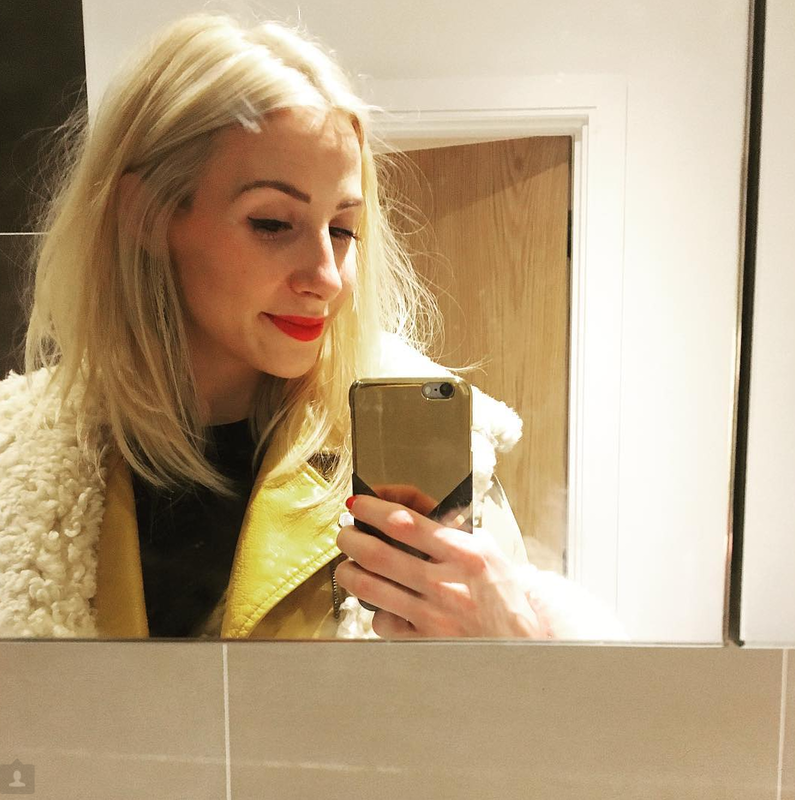 Here it is, the second post on our incredible New York Beauty Swap from the fabulous ladies over at Pass the Rouge Beauty Blog. This post focuses on a few skincare/ hair bits and bobs that these two sisters chose for us including a rather hilarious Aloe Vera Mask, which almost made Jess pee her pants when she put it on for the first time! 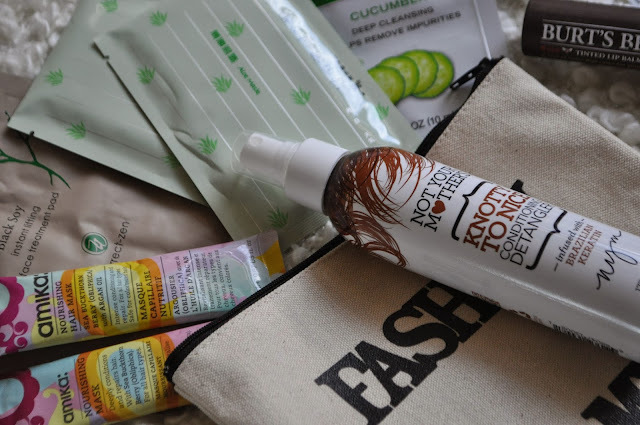 Up first, is Becki's hero product from the entire NY beauty box, which is from a brand called Not Your Mother's and it is the Knotty to Nice Conditioning Detangler (Wow that's a mouthful hehe). Becki has insanely long hair at the moment and this product has literally become a must have after washing her hair. Matched with a Tangle Teezer, there ain't no knots that this duo can't get through! Becki tends to spritz it all over her hair after washing it and starting from the ends, slowly works her Tangle Teezer through her hair. 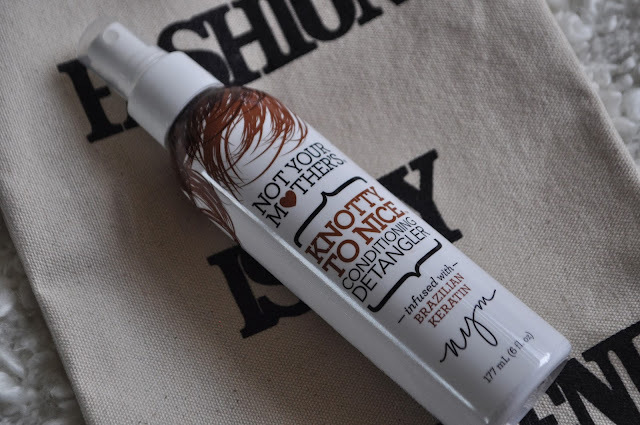 This Conditioning Detangler, smells beautiful and doesn't weigh down your hair at all. Honestly, without it, she would look like a scarecrow! 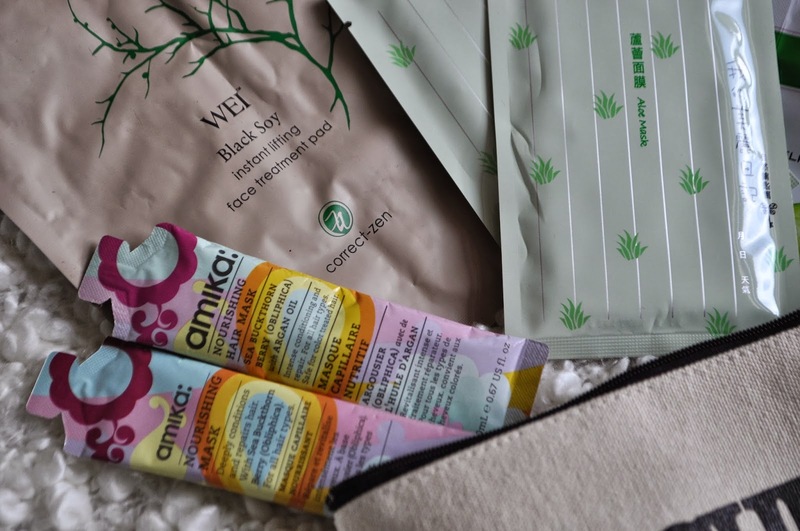 Next up is a few face masks, which we have to share how much love we have for Pass the Rouge's choices. Our favourite has to be the Aloe Mask that helps to sooth and hydrate the skin. This mask wasn't any normal, slap it on mask, it was a mask that you opened out and laid it straight onto your skin. The reason why Jess almost peed her pants with this one, was because it looks hilarious on! The mask had tiny little holes for your eyes and a funny opening for your mouth. We literally can't explain how funny this looked on - it was amazing! After removing the mask, teary eyes and all, our skin felt smooth and cooled. Both Amika masks were fantastic for our dry hair, especially for Becki's dry ends (Yes major Ombre overkill!) and were a lovely addition to our pamper evenings. We passed on the Wei Black Soy Instant Lifting mask to our Mooma, who absolutely adored the mask. 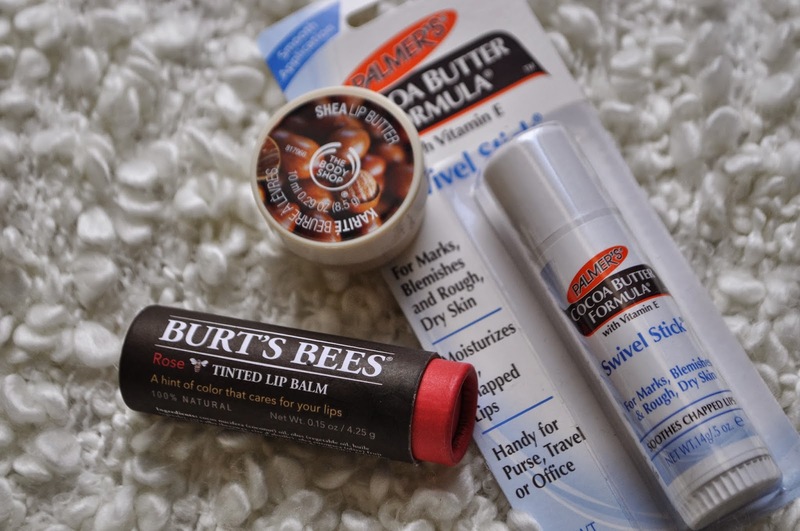 The last few bits in this bundle of joy was three fabulous lip balms. Our favourite has to be Palmer's Swivel Stick, which actually have only just launched here in the UK and we will forever be fans of their Cocoa Butter scent. This lip balm, in fact might be the biggest lip balm we have ever seen, being the size of a Pritt Stick! The balm smells amazing and feels very hydrating, especially in this chilly weather. You can also use the balm on dry patches of skin that is always handy if you like to keep your bag light whilst you travel. There you have it, part 2 of our fabulous NY beauty box swap, only one more collection to share now - the makeup! Once again we can't thank you enough Valerie & Michelle for an amazing collection of products - you spoilt us! 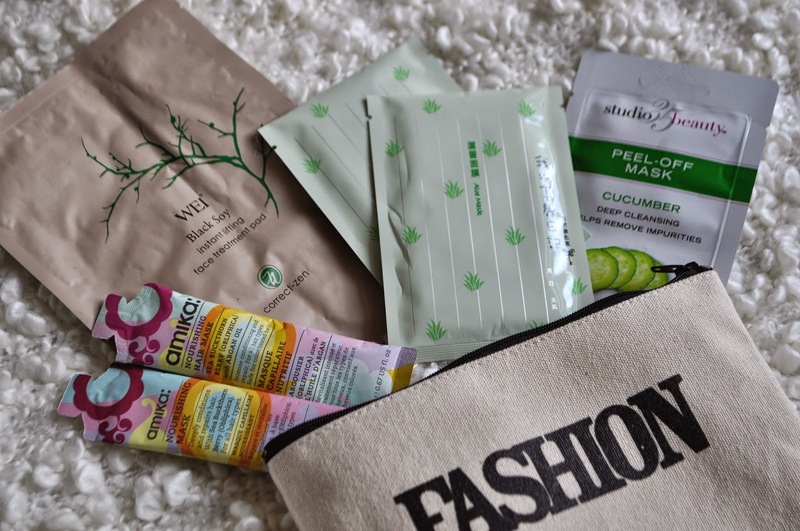 TAGS BEAUTY BOX., HAIR., MAKEUP., SKINCARE.